Rodney Hood is drawing no shortage of interest on the trade market. With the Utah Jazz seemingly not-so-thrilled about footing the bill for his next contract, the 25-year-old continues to be one of the most talked-about names on the NBA’s chopping block. Leading into Thursday’s deadline, no fewer than five teams are trying to land him—the Chicago Bulls, Detroit Pistons, Oklahoma City Thunder, Orlando Magic and Denver Nuggets. 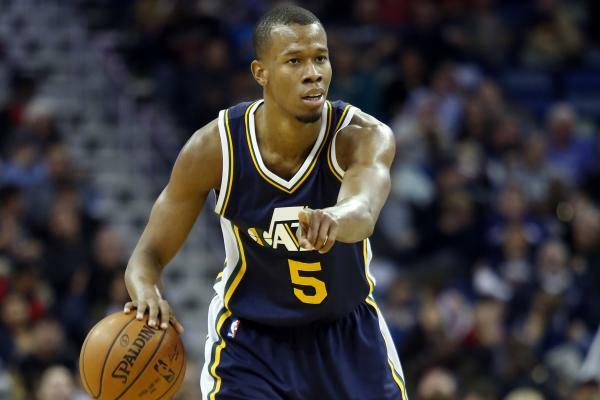 With the NBA’s trade deadline looming Thursday, the Oklahoma City Thunder, Chicago Bulls and Detroit Pistons are all showing interest in acquiring Utah Jazz shooting guard Rodney Hood, The Salt Lake Tribune has learned. League sources say the Denver Nuggets and Orlando Magic have also shown at least a passing interest in Hood, who is set to be a restricted free agent this summer. Hood’s name has been mentioned in trade talks for a few weeks, and the Jazz have been active on the market in an attempt to fortify their roster for the remainder of the season. The Jazz would like an asset for Hood, according to sources. A first round pick would be optimal. Last week, the Bulls garnered a first-rounder when they traded forward Nikola Mirotic to the New Orleans Pelicans. But the Bulls were forced to take on a bad contract — center Omer Asik — in return. It remains to be seen whether the Jazz would be willing to do that. The Pistons shouldn’t want to tack on long-term salary by re-signing Hood in restricted free agency, but Stanley Johnson will cost them a pretty penny in 2019. Hood is more intriguing because, while he’s not the same defender, he can hit threes and the occasional pull-up jumper. The Bulls’ interest is borderline vexing. They need wings, but they shouldn’t be trying to land players who require a swift reinvestment—particularly when the Jazz don’t appear to be selling low, and especially when they have to worry about paying Zach LaVine over the offseason. The Magic are another weird suitor. They need to be focusing on cost-controlled assets and draft picks. Hood is neither. Unless they’re super low on Aaron Gordon and willing to do something like him and Fournier for a return built around Derrick Favors and Hood, they’re not going to make headway. The Nuggets are kind of interesting. Hood would be a nice fit alongside their blend of playmakers and shooters. But they really need a wing who can defender bigger perimeter assignments. Is that Hood? Maybe. Are they willing to blow past the luxury next season to re-sign him and Nikola Jokic? Again, maybe. Would his arrival spell the departure of Will Barton and Wilson Chandler (player option)? Once more, maybe. Too many questions exist here. The Thunder make the most sense. They need an Andre Roberson replacement after he suffered a season-ending patellar injury. Hood is nowhere near the defender he is, but he at least ensures Carmelo Anthony isn’t matched up with a premier wing. Oklahoma City’s luxury-tax situation is something to watch here, but it’s not too much of a concern this season. The organization is already committed to paying it. And Hood would be a nice consolation prize should Paul George bolt in free agency himself. Where will Hood land? Will the Jazz even move him? Rumor has it the shocking—or not-so-shocking—conclusion is set to drop no later than 3 p.m. ET on Thursday.